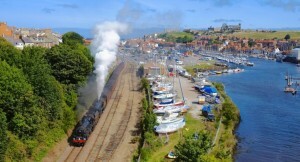 The Trustees decided at the Gathering at Whitby in September 2016 that it would be a good idea to try a different approach t the Gathering in 2017. We might attract more supporters if we offered just one day in a more central venue that was easy to access by public transport. 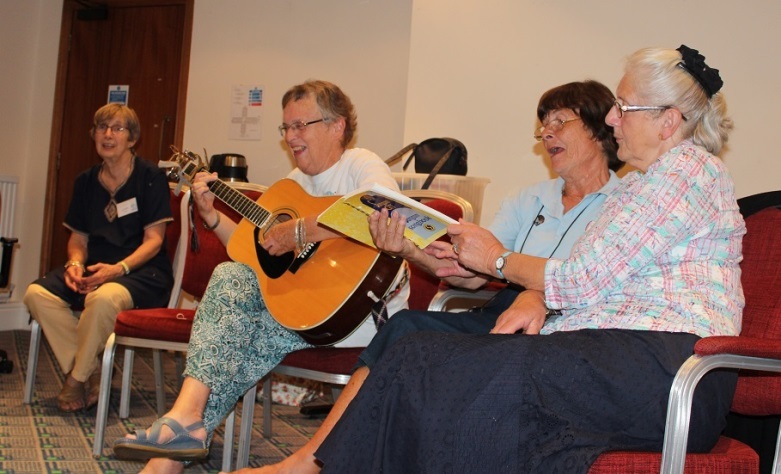 Plans were made for an Activity and Information Day, to be held at Trefoil House in Birmingham. 60 ladies registered for the day, not all members of F.O.S. (UK). There was a traditional Sangam Welcome Ceremony and a large number of activities were on offer which Guiders could take back to their Units. They could make bracelets, bags out of T-shirts, colour snakes and elephants, put on saris, do a quiz about India and Sangam and play Kim’s game amongst other things. Before lunch, most of us were taught how to do Bhangra dancing. We said “Goodbye “ to Hilary Taylor who was flying to Delhi for the WAGGGs World Conference and thought about her taking off as several of us who were staying overnight were enjoying an excellent Indian meal in a restaurant in the City centre. Alas! Her flight was cancelled and Hilary spent an unexpected extra night in Birmingham. We heard later that arrangements were made for her to fly out the next day and just make it in time for the opening ceremony. 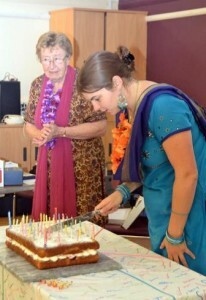 A light lunch of either chicken or vegetable curry was very popular and activities resumed in the afternoon. 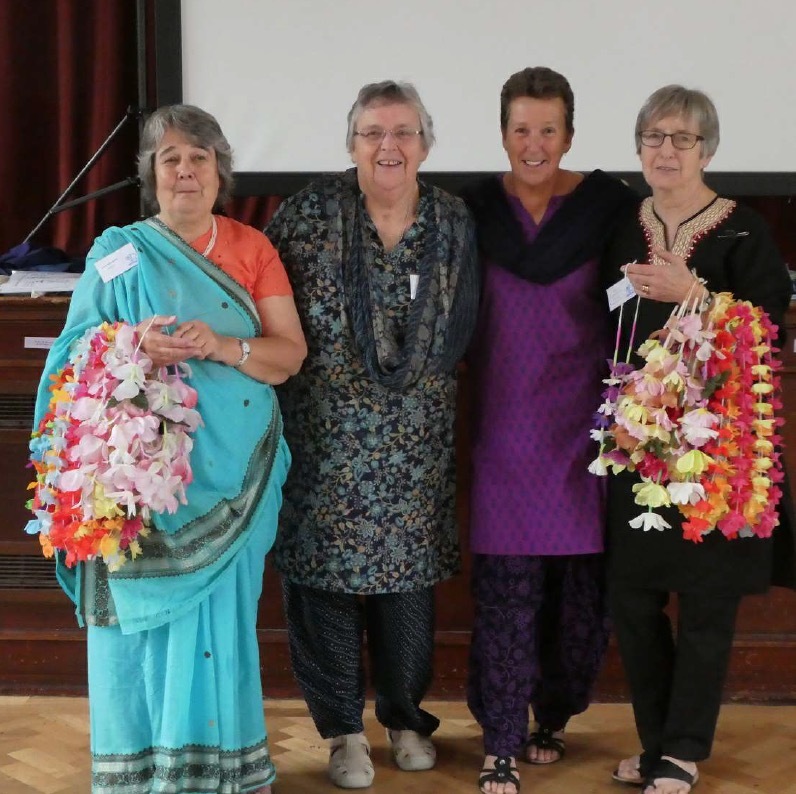 Before the Annual General Meeting, Victoria Bagshaw gave a presentation about the visit several of us made to Sangam, for the amazing 50th birthday celebrations. Although the day was intended to be for information, a recruiting day and an opportunity to hold the Annual General Meeting, a substantial amount of money was also raised for Sangam. This was as a result of sales and a raffle. 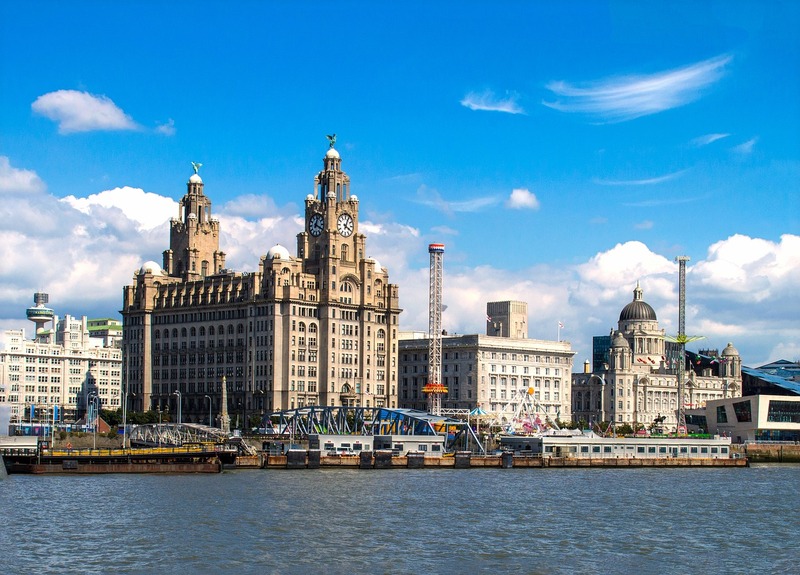 Liverpool, our City of Culture, looks forward to welcoming the Friends of Sangam (UK) members. Cost~ The whole day is £25, including lunch and tea/coffee + AGM. If you would like to come for specific points in the day, please see pricing below. You can enjoy a Friday/Saturday night stay in the Adelphi at a special room rate of £48.00 single B/B per person, or £65.00 B/B per room, for twin/double, by booking directly with the hotel (Tel 0151709 7200, using ref FRIE150918). Friday evening ~ Liverpool Experience. To book in, please complete this form attached here by 31/07/2018! Visit the Elton Campsite, Nottinghamshire between 15-16th October 2016 and you might see a massive celebration! 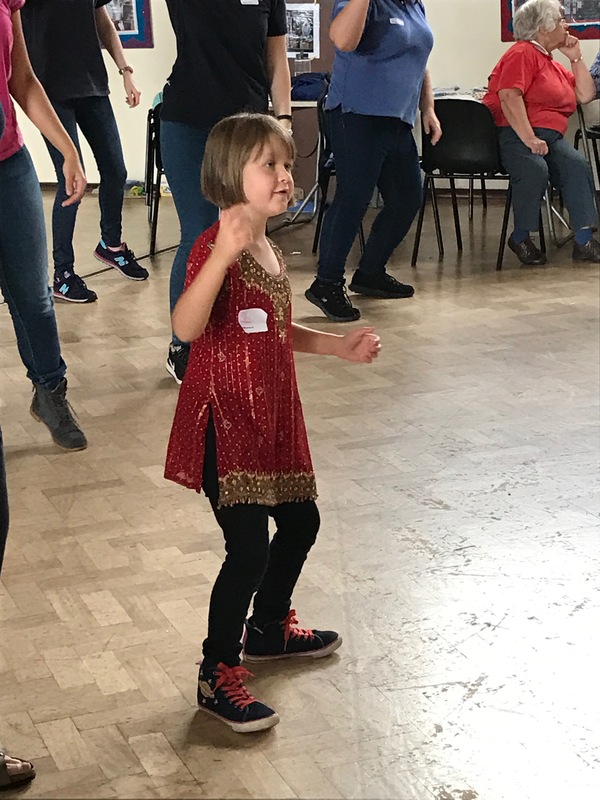 As Sangam turns 50 that weekend, Junior Friends of Sangam (UK) will be celebrating in style, bring your Brownie, Guides or Senior Section members to celebrate this moment in Sangam’s history. When: The weekend will run from Saturday 15th at 10.00am until Sunday 16th at 3.00pm. You can come for the weekend or for a day visit. Who: Brownies upwards with a leader, for day visits and Guides and Senior Section may camp. Contact: Susan Westwood- susanpwestwood@hotmail.com for more information. More detail and application form can be downloaded here! Our 2016 AGM and gathering will be held at Sneaton Castle Centre, situated on the edge of the historic, picturesque seaside town of Whitby. We have booked Bede Hall for our activities and standard rooms which are well serviced with bathrooms, showers and toilets. The total cost of the stay will be £120 and a non-returnable deposit of £25 will need to be paid by 30th April 2016 if you wish to attend. With the full balance due by 1st July 2016. If you wish to attend please complete this form and return it with your deposit and a SAE to : Jean Sutherland, 87 Colburn Lane, Catterick Garrison. N.Yorks DL9 4NX. We look forward to seeing lots of you in Whitby! A glance at the application form for the weekend might have lead you to believe that you would be staying in a small half timbered hotel with associated primitive facilities. However this was a picture of the Old Siege House, one of the many historic buildings in Colchester. The Marks Tey Hotel, a Best Western, was very different! The rooms were spacious and comfortable – I have never seen curtains draped quite like those in our room – and there was plenty of parking. Tina had made several planning visits and double checked all the details while we were there but it did seem that the Management team did not communicate with their staff “at the coal face” and there was some confusion about our community rooms. This made it very difficult for Tina to carry through her original programme plans. On Friday evening we shared a dining room with a coach party from Swansea. Consequently we could not use this room for our evening activity and, as our numbers were small, we took the opportunity to chat and catch up with Friends in the lobby. Our new member, Marcos from Brazil, told us a little about Scouting and Guiding in his home town. We enjoyed a cooked hotel breakfast and, after some confusion, the hotel staff rearranged the room into Annual Meeting format (including a table for coffee!). A few members, including 3 year old Willemena, joined us for the day taking the number attending up to 29. After the AGM we were moved, again, as we were to be joined for lunch by another group. We now had a small “conference” room with not many chairs, but it was ours for the rest of the weekend. Tina had organised a wide game but the space did not really lend itself to that – perhaps this was a “Narrow” game! We started with a quiz which appeared to be mathematical, to Hilary’s concern, but was really more logical with a twist in each question. After that some people managed to pack over 50 items of clothing into a small rucksack while others completed Word Searches and Dingbats. In the tradition of the Sangam gathering we donned our Indian garments for lunch and must have caused a stir amongst our fellow guests. The hotel was also hosting two weddings! After an Indian lunch many members did their own thing – including walking nearby and swimming in the hotel pool. The evening meal was again shared with the coach party from Swansea, but this time the hotel had managed to lay up the right numbers for each party and the staff were very attentive. After dinner we retired to the small conference room and some of us stayed up for a Sangam Song book sing song. The weekend then closed after breakfast on Sunday leaving us time to explore Colchester before we set off on our journey home. The numbers attending the weekend were far fewer than those attending in recent years but most of us agreed that it did give us a chance to chat with more people and get to know each other better. 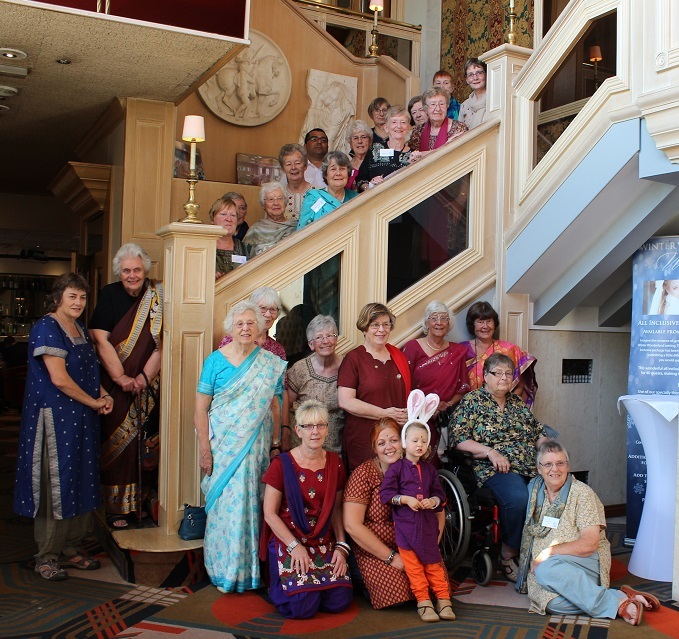 We all have Sangam in our hearts and this weekend gathering presents an opportunity to re-live past visits and to hear of updates in India, to renew friendships and make new ones. Big thanks go to Tina for arranging the weekend and keeping calm when we were being moved from pillar to post. Despite the small numbers the sales and tombola raised over £500. Kinetic Torches in Blue, Pink, Purple and Red (size 5 x 3 x 10cm). 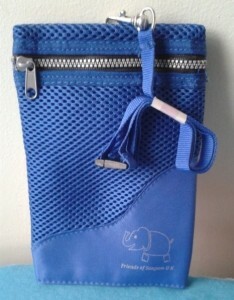 Price £2.50 (No running costs!). Postage is £2.80 for up to a box of 12. The size of a torch means we have to use the small package rate even for one torch. 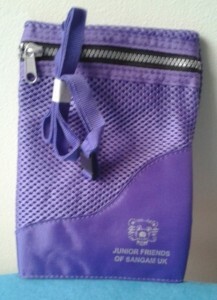 Purple with the Junior Friends logo and blue with the Sangelee logo. The neck tie has a clasp which allows you to thread it through belt loops too. We still have a few pens available. Price £1 each plus postage at £1.50 for up to 12 pens or a stamped addressed envelope for one. To purchase any of these items please send your order with a cheque made payable to Friends of Sangam (UK) to: G Shepherd, 73 Springfield Road, Southwell NG25 0BS or you can email any enquiries to gill@shepherdathome.com. The 2015 AGM and Gathering is being held from the 11-13th September at the Marks Tey Hotel in Colchester, Britain’s oldest recorded town. The cost of the weekend is £120 for those sharing a twin bedded room and includes full board, from dinner on the Friday evening, to breakfast on the Sunday morning. If you would prefer a single room this will be an additional £40 for the weekend. For those who would like to come as a day visitor on the Saturday, the cost is £24, and will include all activities and lunch. Additionally details of other places to stay in the area, including Scout sites, are available upon request. We have deliberately not included Sunday lunch in the cost because of how much there is to see and do, in the area – e.g. walking, bus tours of the town, visits to Constable Country or Beth Chatto’s famous garden. It was felt members would welcome the chance to explore in their own time (and make their own food arrangements) rather than having to ensure they were back, for their meal. Venue suggestions will be included, with your booking confirmation. If anyone would rather eat in the hotel, though, both bar snacks and the full restaurant menu would be available. To secure your place, please post, or e-mail your details, as set out in this booking form. You’ll need to pay a non-refundable deposit of £20 per person, by 31st May 2015. The balance is then to be paid by 31st July 2015. If anyone would like to spend longer at the hotel (either before, or after, the Gathering), please indicate this when you book. Sangam’s swimming pool has been operational since 1974 and is a great place for volunteers, guests and staff to relax and connect! Since then repairs have been undertaken for various issues, but the pool still has the original concrete shell and is finally showing its age. Currently the pool is leaking water along a major crack that has developed through the width of the pool and Sangam now needs to completely rebuild the pool. 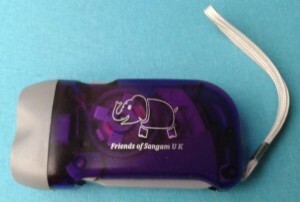 In 2014 Sangam launched a campaign to raise funds which Friends of Sangam (UK) has been actively supporting. 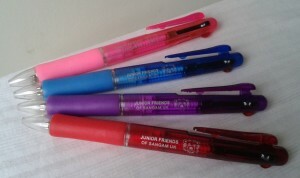 We are selling Junior Friends multi-writer pens for £1. The pens come in four colours: blue, red, pink or purple and have three coloured inks (red/black/blue) in one stylish pen. You could perhaps use them as gifts for your units or Leaders. If you could like to order any of these pens please contact Gill Shepherd, 73 Springfield Rd, Southwell NG25 0BS. In your order you will need to include the number of pens you wish to order and the colour. Please also enclose a cheque payable to Friends of Sangam (UK) including the cost of P&P. This is £1 for up to 8 pens and £1.50 for 16 pens. Update: So far we have been able to buy three tiles for the pool by selling these pens and we are hoping to have bought another three by September! 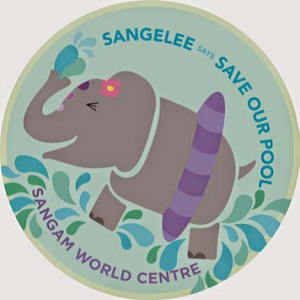 Friends of Sangam New Zealand have written a Pool Challenge badge. If you would like a copy of the challenge badge please email Gill on gill@shepherdathome.com. We also have the badges available to purchase by contacting Gill. Members couldn’t have wished for a sunnier welcome to Waddow Hall on a perfect autumn day, but even the autumn colours outside paled when the doors opened on the incredible décor in the hall garlanded and draped in saris of many colours with a male and female manikin again beautifully attired in Indian dress it really was the most impressive entrance. Following a traditional Lancashire hotpot dinner members gathered in the Three Counties room to hear Hilary Taylor relate tales of the witches of Lancashire. S aturday was yet another beautiful day with the sun blazing through the windows adding to the colourful assembly of members in their saris and Punjabi suits. 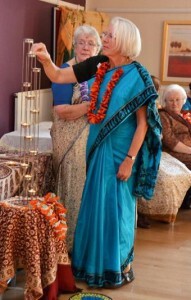 Liz Aveston explained the significance of the welcome ceremony before members received the symbols of turmeric, rice, coconut and sugar from the puja tray. Margaret Wellock then opened the AGM with a prayer. President Jane Wardropper gave her address and reviewed the past year. The Trustees were introduced to the assembly as some had commented they were unable to put names and faces together. Jen Barron, World Centre Manager at Sangam, and Friends of Sangam from overseas had sent greetings which Liz placed on the notice board for all to read. 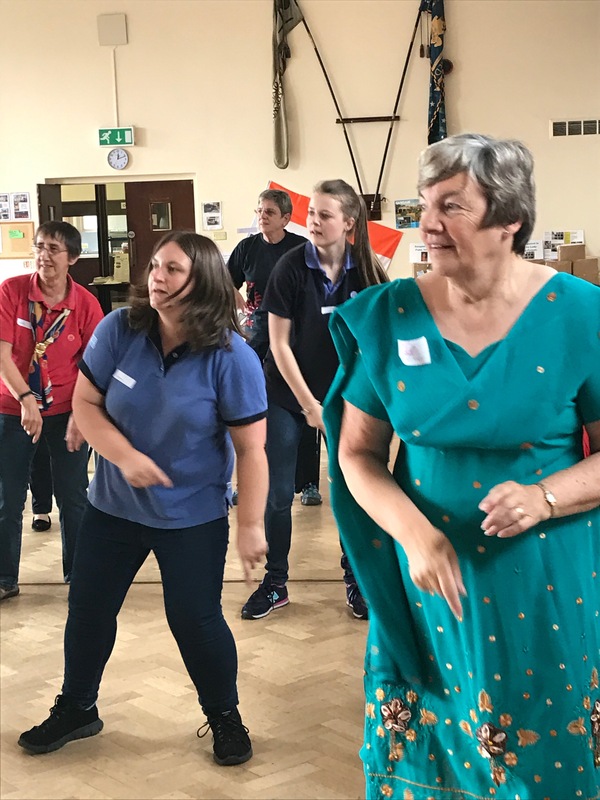 As the various trustees gave their reports it became apparent how even though many of us have not been to Sangam in the recent past the spirit is still very alive in FOS (UK) members. After a delicious Indian lunch the stalls were opened and we were able to spend, spend, and spend. There was an opportunity for catching up with friends and acquaintances over a welcome drink and a piece of Sangam’s 48th birthday cake. The staff at Waddow really excelled in the food they presented so when the evening’s entertainment began some of us rather wished we hadn’t eaten so much – but it was hard to resist. Our entertainer entitled his act as Dance Around the World and took us firstly to India and then to America and Brazil. We then joined in the inevitable Conga and ended with the Hokey Cokey. Sunday was another brilliant autumn day which was fortunate as Margaret Wellock had organised a variety of local walks, a visit to the castle or a trail and quiz. All too soon it was time for lunch, which was, what else but roast beef and all the trimmings. How quickly the weekend had passed and it was time for the closing ceremony followed by many goodbyes and see you next year. There was no doubt that the gathering had been a memorable event and we give our sincere thanks to Margaret Wellock and her team. We look forward to seeing you next year in Colchester. If you haven’t already completed the Sangam Challenge badge and purchased your badge, you can download the pack here! How about completing it with your unit? And at the same time you will be raising money for Sangam through purchasing your badges. We look forward to hearing from you!